I hold my hands up to not writing nearly enough about art and accessories for our homes. 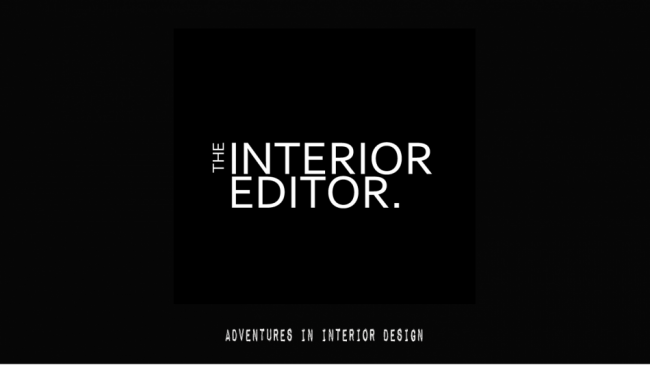 Considering these elements are as important as the paint we put on our walls or the chair we choose to sit upon, I thought I’d introduce you to this weeks Meet The Designers – The Curious Department. They address both in a somewhat curious way that I’m sure will delight all of you that seek the unique and different for your homes. 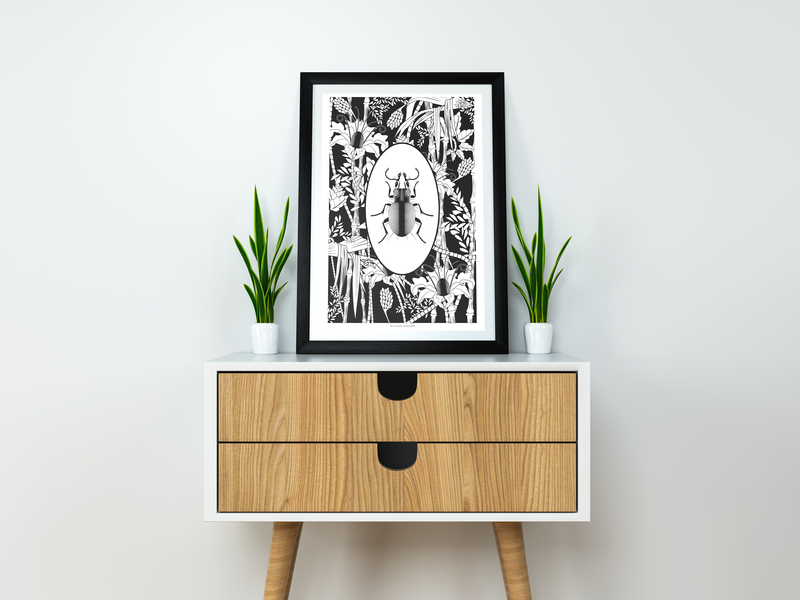 This wonderful emerging design studio and online boutique is a treasure-trove of nature-inspired homewares, limited edition art prints and ethical taxidermy. Oh, and if you love a bit of metallic glamour and art deco inspired style you’ll absolutely love their designs. I know I do and hope you will too! 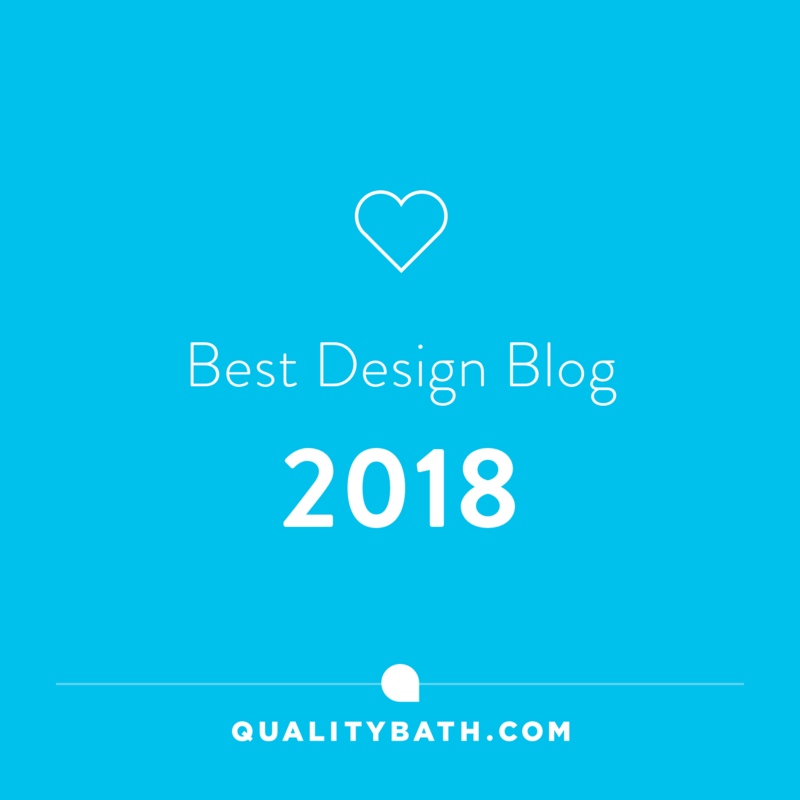 Launched in August 2016, The Curious Department have certainly made an impact on the interiors world with their nature-inspired homewares and art. Designing out of their London Studio, the founders of this fabulous company are set to inspire you and add some personality to your homes. There’s no massed-produced blandness here. They’ve also recently introduced a range of stationery designs to their repertoire and, as a serious notebook addict myself, these are perfect for adding a bit of glitz and glamour to your note-taking. I’m actually going to have to reorder myself another notebook as the I.E. Hubs was smitten with the design and claimed it as his own! 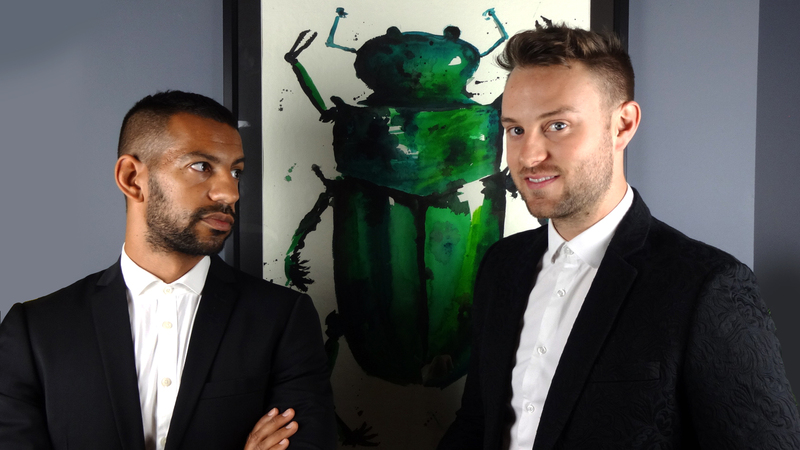 Ross and Chris are the masterminds behind The Curious Department. As homeowners themselves, they came to realise that there was a gap in the market for interesting and curious homewares that were affordable and not mass-produced. Seeking to design and produce homewares that reflected by their passions and personality for budget-conscious home lovers they offer your homes a uniqueness with their patterns and metallic details. 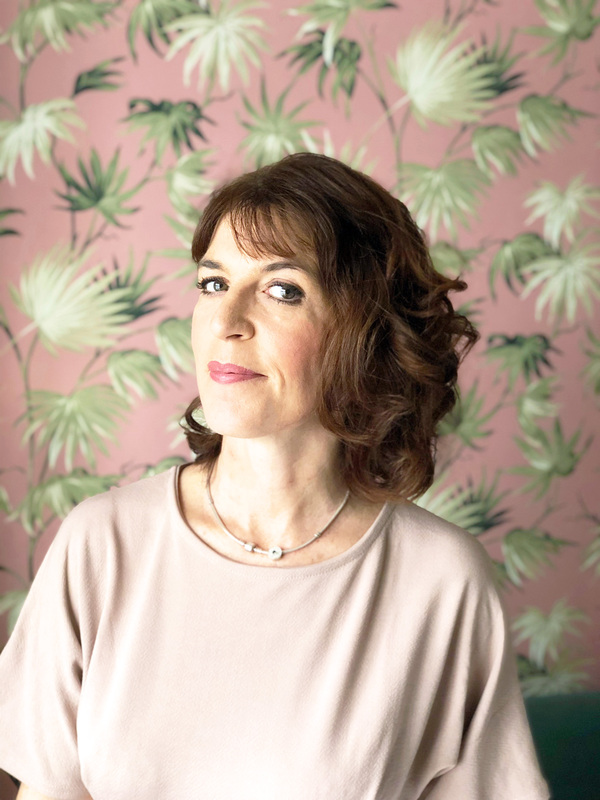 The business was born in Shoreditch House after a few cocktail-fuelled conversations. Having turned a room in their home into a studio they began to work on designing their first collection, Metamorphosis. In September this year, they exhibited at their first ever trade show, Top Drawer which motivated them into creating a second collection Elemental. 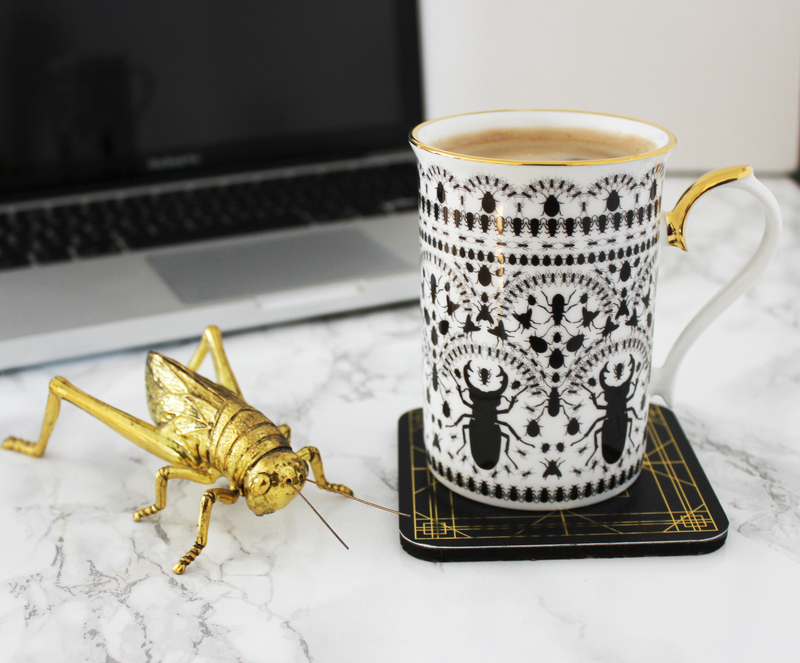 Deco Scarab Coasters – The Curious Department An ancient Egyptian symbol of renewal and rebirth, a source of inspiration for The Curious Department. The scarab forms part of their logo. 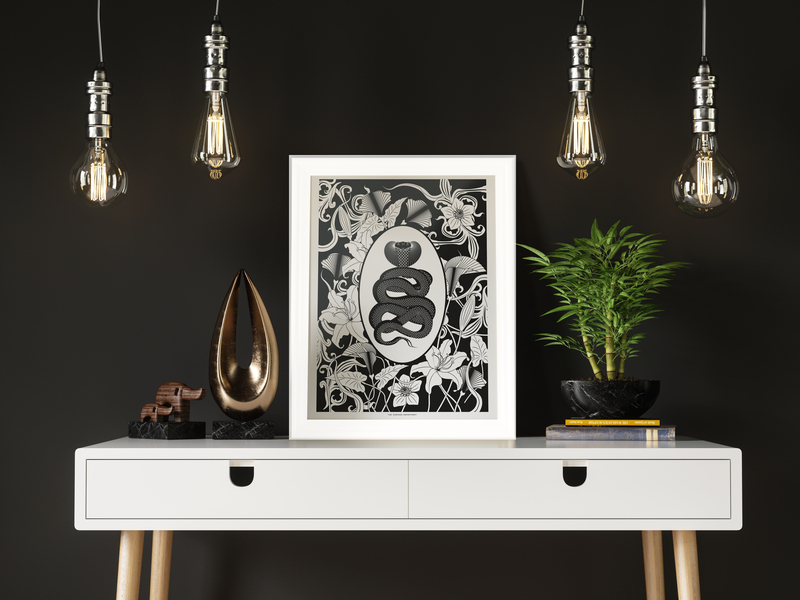 Embellished with gold foil and surrounded by intricate deco lines, this design will glisten and ripple in the light of your home. Their creative journey so far has been received with full-on enthusiasm as their designs are starting to attract more and more attention. With features in House Beautiful, Houzz, Home Style to name but a few, word is certainly getting around about their curious designs. Ross is the creative force behind all of The Curious Department designs and Chris handles all of their business operations. Although Ross and Chris admit that living and working together has had its moments. Recently on a family holiday, they had a bit of a “disagreement” on how to record an Instagram story and somehow managed to record the whole spat and accidentally post it! It’s a memory they’re able to laugh about now but at the time one of sheer panic as they rushed to delete it. 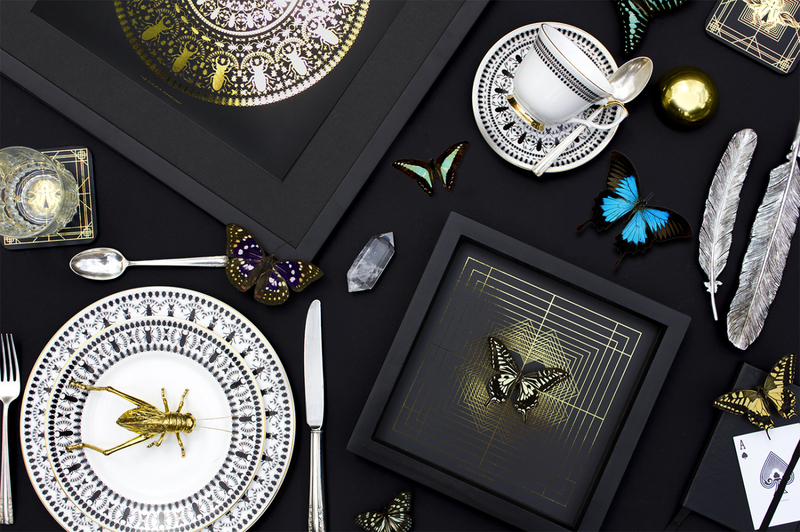 The Curious Department’s first collection Metamorphosis features butterflies, bugs and beetles portraying their love and appreciation of nature in all its forms. Transforming unexpected little critters into mesmerising objects of beauty. All of their designs (apart from the butterflies) are made using British-sourced materials and local expertise where possible which helps reduce their carbon footprint which is great for our environment. 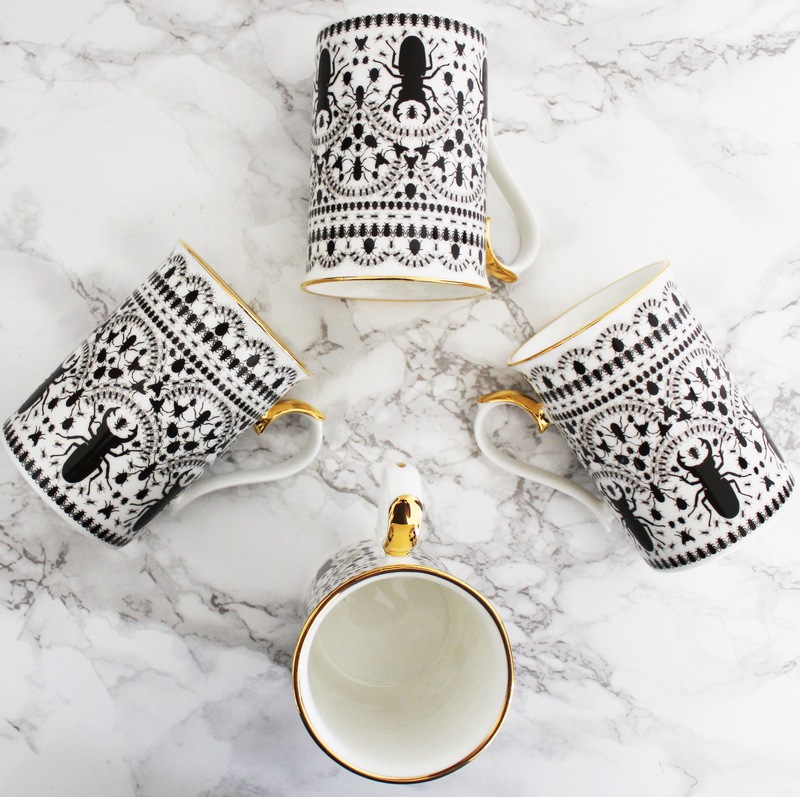 The Curious Departments fine bone china is handmade, hand-fired and hand-decorated in Stoke on Trent. The Curious Department’s complex Insect Mandala design is one that really catches the eye. Allowing you to admire the form and complexities of creepy crawlies which we would ordinarily turn away from. The overall circular form of the design portrays life and vitality of the natural world (sun/moon), whilst the gorgeous gold detail exudes an air of luxury and glamour to this design. This particular design has been utilised in many forms such as cushions, art prints, coasters and recently fine bone china. In 2017 The Curious Department successfully completed a Kickstarter crowdfunding campaign for their first ever ceramics collection, Insect Mandala. They raised nearly 194% of their original target in one month and were named a “Top 10 Brand To Watch” by London Evening Standard. By limiting their prints to 100, The Curious Department provide you with a sense of discovery and individuality to your homes. Personally, I’m loving their Beetle In The Rain shown above. With limited edition prints starting at £10, they’re incredibly affordable and are sure to delight someone as a gift or why not treat yourself. I have and can’t wait for my awesome little green critter to arrive! Black Butterfly Kaleidoscope Vegan- Suede Cushion – Playfully combining the Victorian fascination with entomology and the symmetrical patterns of the kaleidoscope, this design showcases our favourite butterflies, from the electric blue Ulysses to the subtle green tones of the Chinese Peacock. The Curious Department also offer soft furnishings in the form of cushions and these would be the perfect accessory to update a tired room or to add some beautiful insect mania to. At £40 they really are a fabulous buy. As humans we have long been inspired by butterflies from their life cycle, colour and ornate patterns and The Curious Department have captured these beautiful insects perfectly. Playfully combining the Victorian fascination with entomology and the clean-lined opulence of the Art Deco Period, these custom mounted butterflies on limited edition gold geometric prints add a splash of luxury to your home and provide a fitting showcase to ensure the butterfly continues to share its beauty in the life eternal. The Curious Department is a company that cares about the environment and where they source their butterflies. They only use ethical conservation farms across the world mainly in South America and Asia where the butterflies live a happy and full life before being collected. The farms that they support help stimulate local economies and provide an alternative to deforestation, which is really important to them. Species are selected on their colour and shape. From the obvious dazzle of the Ulysses to the hidden complexity of the Chinese Peacock, to the petite but vibrant Purple Spotted Swallowtail. I’m simply in love with The Curious Departments second collection ELEMENTAL. As a former florist, I love how they have captured the elegance and sheer beauty of mother nature itself. This beautiful new collection explores the synergy between floral habitats and the creatures that dwell there. Each design represents the four key elements of earth, air, fire and water through the use of pattern and forms each blurring the boundaries between flora and creature. This collection is also inspired by Art Nouveau and Hollywood Regency periods adding an air of opulence and elegance to your homes. Elemental Gift Cards – Each gold foiled greeting cards come blank for your own personal messages. Art prints are available in this collection as well as a beautiful new stationery range of gift cards and notebooks. Each gold foiled greeting cards come blank for your own personal messages. The Curious Departments goal is to expand their repertoire of designs to create a wider and more diverse range of homewares. So be sure to watch this space!! In the meantime, Christmas is just around the corner and The Curious Department may just be the answer to finding affordable gifts for your interior loving family and/or friends or why not treat yourself! You can find all their designs here. That’s all from me today and until next time, thanks for stopping by!